Any chance your RTAB brackets are installed upside down? I had the same camber issue a while back because of that. No sir. The rear of my black car sits a little higher than 'normal' and so this is why my camber is lacking. Can anyone confirm what the regular M3 and CSL M3's rear toe settings are in degrees? I'm looking at my alignment sheets from two places, a BMW dealership and an independent shop. The independent shop's computer shows 0.30° total toe in for CSL and 0.36° for regular. I only have CSL toe in specs from the BMW dealership, which is 0.03-0.17°. 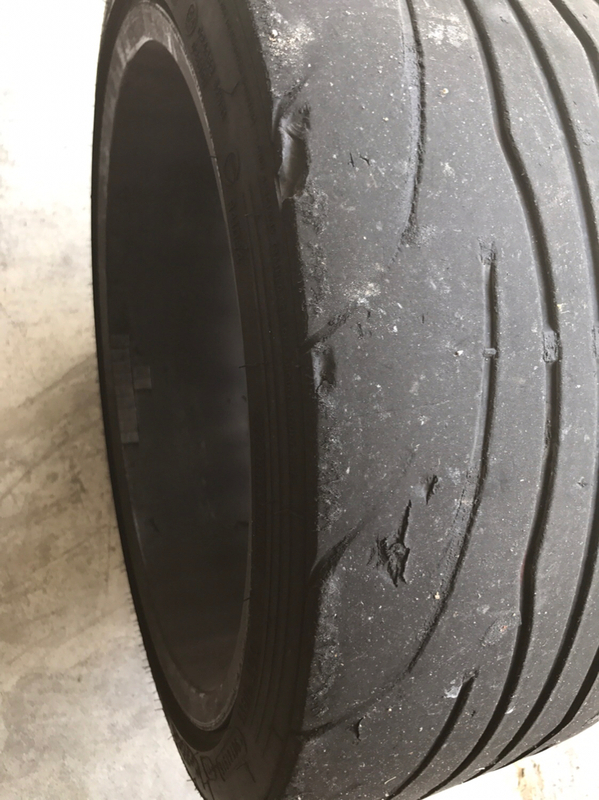 I'm wondering if the 0.36° is the reason I had excessive inner tire wear. I was going to do an emergency toe adjustment but decided not to mess with the alignment. I have time to take car to get a proper alignment now. I may be misunderstanding what you're saying/asking, but total toe is the measurement of both sides added together. The measurements given are MAX recommended. So total toe of 0.30° is 0.15° toe-in on each wheel and 0.36° total toe is 0.18° toe-in on each wheel. The 0.03° - 0.17° specs from the BMW Dealer were definitely listed as per side, not total. So the specs given by both Indy shop and Dealer were both pretty much the same. Dealer gave range, Indy shop just listed max, I've seen both. BMW recommends between 0.03° and 0.17° toe-in, not to exceed 0.36° total toe. Also, excessive wear on the inside of your tires comes from too much TOE-OUT, not toe-in. Positive toe is toe-in and negative toe is toe-out. That said, how much negative camber do you run in the rear? I find it hard to believe you'd be running toe-out in the rear. It doesn't make sense. But I can see negative camber and zero toe wearing your inner tires pretty bad. -2 front -1.6 rear with CSL toe in settings. Car is on Koni Yellows with schnitzer springs & GC street camber plates with staggered Schnitzer type IIIs 8.5/9.5 225/45/18 - 255/40/18). Car is more comfortable after the alignment, rear end is stable when accelerating (even though the stock rtabs where like new after almost 145K kms) and also did a road trip and hitting 200-260 km and it feels nice and stable. I might switch to Eibach springs next year. I have not played around with toe as much, just went with TCK's recommended settings which feel nice. I did have camber before at -2.5F/-2.0R and that did feel marginally nicer on turn in. To me this is the sweet spot for a single, sporty, street setup that performs and feels great without being overkill at the expense of drivability or tire life. I run ~32psi F&R normally since I just drive the car for fun on weekends. On road trips, I bump it to ~35 F&R. 245/35 and 275/30 19'' PSS. Not changing anything here. I'm running the same size tires and am asking my shop to align to the specs you have above. The shop is telling me that they need to toe in degrees. Can you tell me if the numbers below look correct? again, this is for Fr: 245/35/19 and Rr: 275/35/19 size tires. Thanks for the help! Thanks, I actually used that same exact website for my conversion. Also, 0.14*3=0.42...if the first looks good the the second is also right. If you don't want your tires destroyed in a few thousand miles run the minimum spec for rear toe. There is no point in running that much toe-in in the rear of this chassis. So - all is right with the world. New RTABs and alignment did the trick - car feels very responsive but stable. Getting subframe reinforced and new bushings everywhere in a few weeks, so I'll be getting an alignment afterwards. Looking for optimal specs for my setup.